Whether we perceive it or not, the forest is alive; there is movement, there is disorder, and—most importantly—there are endless interactions. This last word is the key to help make this hidden world clear to our human “worlds,” which are so short and tiny in comparison to the existence of these forests. 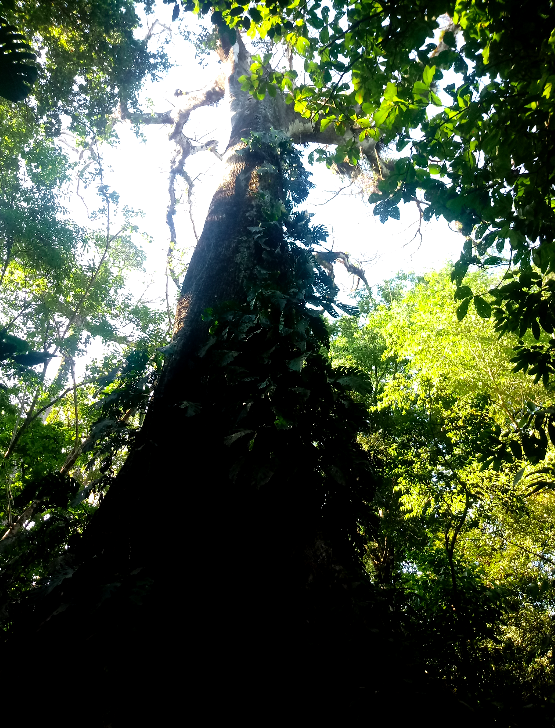 When you walk through the old growth and secondary forests of the Osa Verde BioStation (Piro), you can see everythimg from herbs, seedlings and shrubs to gigantic trees hundreds of years old. Commonly seen are a great diversity of birds and insects, and sometimes one can have the good fortune to observe peccaries or to spot a small wild cat. Now, there are many other things that we cannot witness, either because they occur at scales unimaginable to the human being (at a microscopic level, like bacteria, or in the heights of treetops) or because it would take months or years to notice the patterns of a certain event. One way to notice these small scale changes that happen in the forest is through observing the difference between day and night. In the night, more sounds are heard, even different events or movements are observed. Observing a higuerón seems impressive to us all, but the interactions are what fascinate biologists: the complexity of their pollination related to certain wasp species, the presence of hemiepiphytes (a plant that stays in another) that present the majority of fig trees (Ficusspp) and how they affect the development and biology of other plant species. In addition, there is a large number of birds that feed on the fruits of Ficus and are also their dispersers. The Fig tree is related to an endless number of animals and events. This is considering only a specific tree; therefore, the amount of interactions in the forest is unimaginable, more taking into account that over time new relationships will appear. The sad thing about all this is that as you learn more about the complexity of a forest and the interdependence among all its components, when you hear that people are cutting down a forest, extracting endangered species, polluting of rivers, hunting and causing many other environmental problems, you realize that the impact is at the ecosystem level and that recovering the conditions of a forest with all its interactions will take years or even centuries. When a person for personal and economic interests cuts down a tree that is hundreds of years old and says “there are many other trees” or even plants a new one, perhaps he or she does not know or does not share the great feeling of entering the cave formed at the base of a great old garlic tree (Caryocar costarricense), of feel part of nature itself. 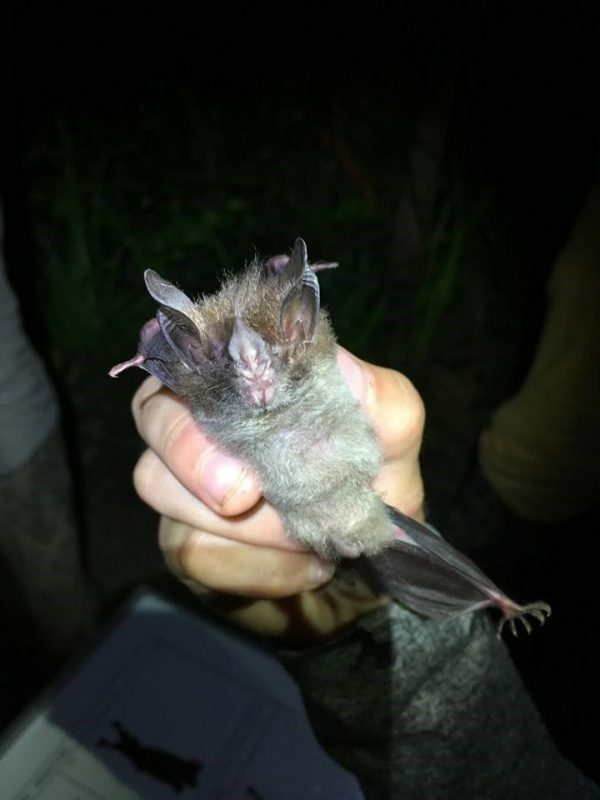 More importantly, perhaps he or she does not see the amount of bats that depend on said cave, the facilitation in the dispersal of seeds, the great source of food for so many animals and all the storage of carbon during decades that helps us to be here today delighting in all these interactions. That’s why I want to be part of those interactions in a positive way, through inducing positive change. As the change from being a Osa Conservation Restoration & Rewilding Field Course student to being the Coordinator of the Healthy Rivers program here, I hope that this challenge helps to conserve many interactions in the veins of our planet. It seems like yesterday when we walked through the gate to the Osa Verde BioStation (Piro) for the first time in January 2017 and were greeted by a group scarlet macaws in the trees snacking and squawking. We’re here now for our third winter excursion, and I have to admit we’ve done some cool things the last couple years. 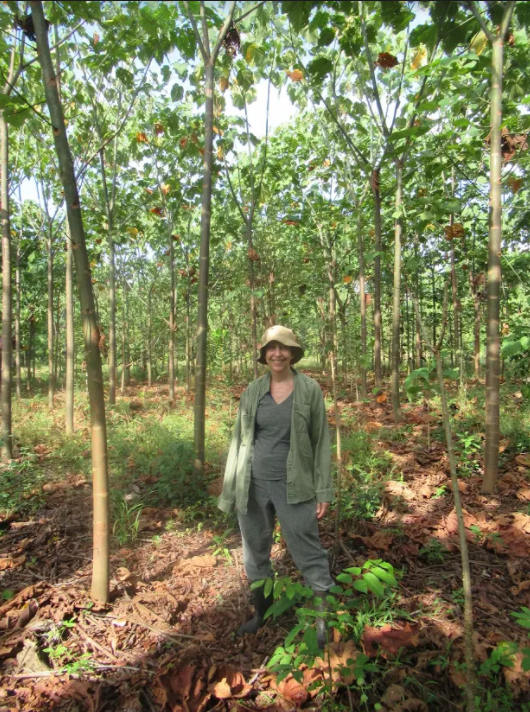 One of the projects we’ve helped with here is reforesting abandoned farmland. Seedlings of balsa trees have been planted, and on a previous stay we were given small machetes and told to clear the plants around the seedlings, a project we lovingly christened ¨Weeding the rainforest.¨ It felt somewhat silly and hopeless, but when we came this year, we found new forests of balsa on the former farmland, proving conservation work frequently requires patience to see results. 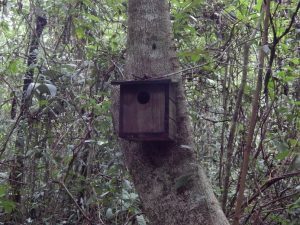 Part of the reforestation process is creating habitats for animals, so this year we helped set up bird boxes to encourage birds to move into the new forest, sort of like opening a piano bar to lure lounge lizards. One of the great lures to volunteering here is the Sea Turtle Program. A newly hatched green or Olive Ridley turtle could give cuteness-lessons to puppies or kittens. When we first came here two years ago, the program was led by local legendary naturalist and photographer Manuel Sanchez. Last year we even got to checked on the hatchery in the afternoons so he could have a vacation. 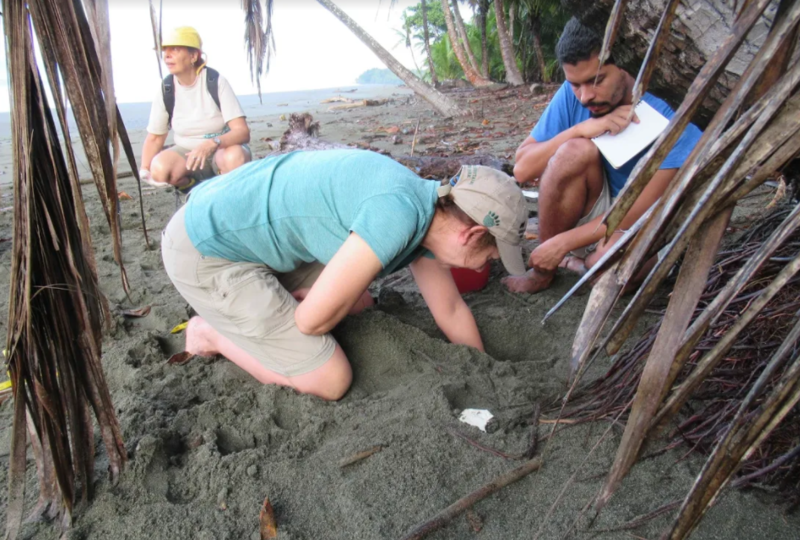 The Sea Turtle Program, like much work in conservation, is a steady commitment. Now the program has several dedicated enthusiastic staff members, frequently assisted by volunteers like us. But the work is still the same, patrolling the deserted beach on breathtaking mornings, finding and relocating nests to the hatchery, releasing the hatchlings to the sea, as well as excavating nests to determine mortality rates among the eggs. And after releasing young turtles for three years, it’s fun to watch people melt. The Osa features a splendid variety of wildlife, from squirrel monkeys and scarlet macaws to cane toads and green turtles. Each trip has brought new sightings or exciting moments of discovery. But one creature has almost brought our marriage to an end each year. No, a jaguar has not attacked us on a footpath. Snakes have not ambushed us in the bathroom. And no, a crocodile has never attacked us on the beach. The problem is that Steve always falls in love with the paraque. 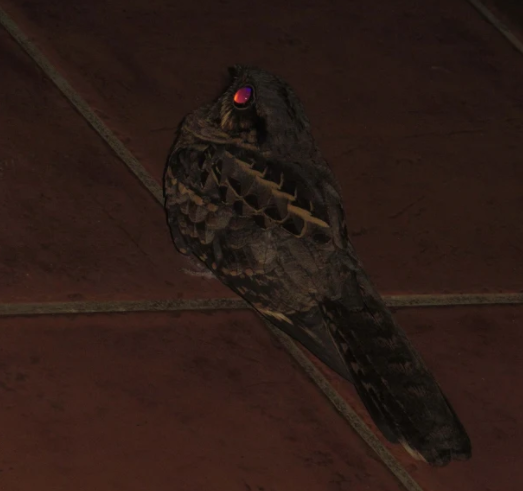 A nocturnal species, the paraque birds frequently sit along the paths of the research station and even in the pavilion, occasionally sweeping through to feed on insects drawn by the light. They make an assortment of whistles to other paraques in the area and flop about when people walk near. They sometimes make cooing ¨bwot¨ sounds. Local folklore includes tales of the paraque calling travelers into the forest to get them or their children lost. A paraque sometimes follows us to our cabina and bwots to lure me outside. Attempts to photograph them at night usually yield nothing but a red dot in the darkness, further evidence of their supernatural nature. The paraque is a heartbreaker though, for when we asked another volunteer what her favorite mammal and bird of the Osa were, she replied ¨squirrel monkeys and Steve’s girlfriend.¨ We hope to leave at the end of the week without Steve pining for his girlfriend at the airport. 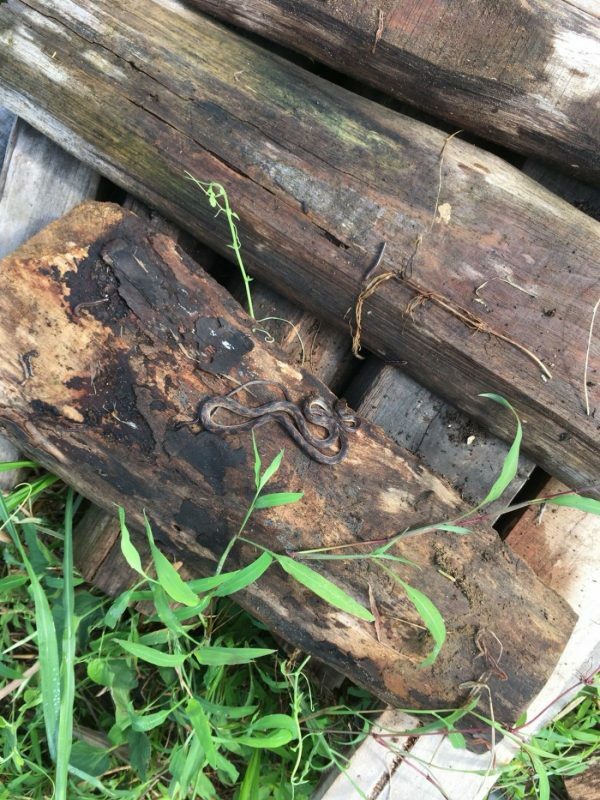 For many of us, the creatures of the tropical forest that dare venture at night remain elusive and mysterious beings, their ways of life foreign to us daytime dwellers. 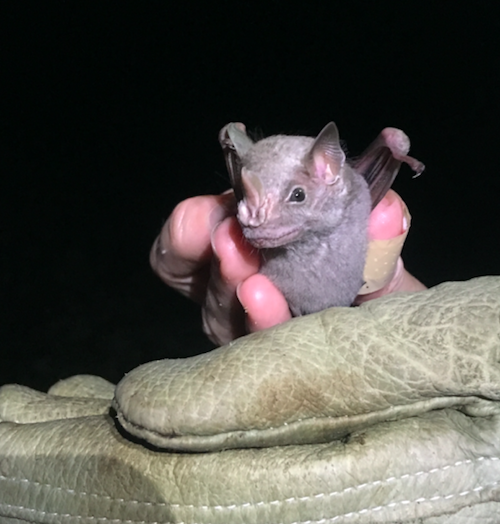 Among these enigmatic animals are bats, the group of mammals with the second largest number of species in the world, whose charismatic presence in the tropics will not go un-noticed to the keen nocturnal observer. Like many sensitive animals, bats are particularly special as a group, since many species require natural areas that have not been disturbed by human activity to find food and places to live. 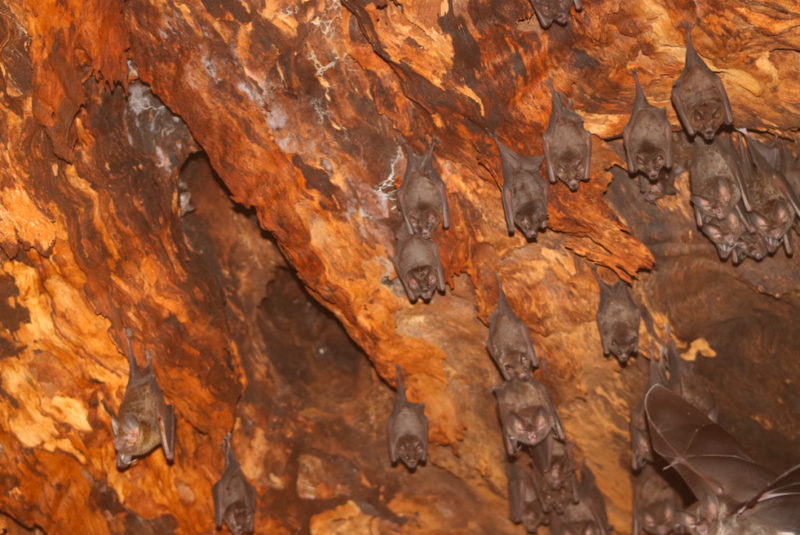 Thus, the presence of many different bat species can provide information about the health of an area. For this reason, Osa Conservation has started sampling the diversity of bats in areas that are being actively restored into forest, after years of use by humans. Overtime, the presence of different types of bats in these areas will help determine the success of restoration. 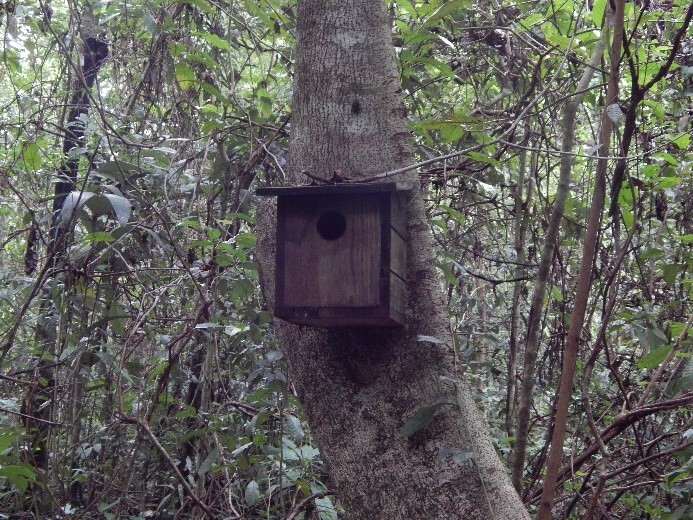 After seeing the restoration plots for the first time this May, I was convinced that the bat diversity in these areas would not be exciting: that is, I expected to find very little diversity, since the restoration areas are in their infancy and have very little forest cover. Was I ever wrong! The bat life in the restoration plots is teaming with diversity. 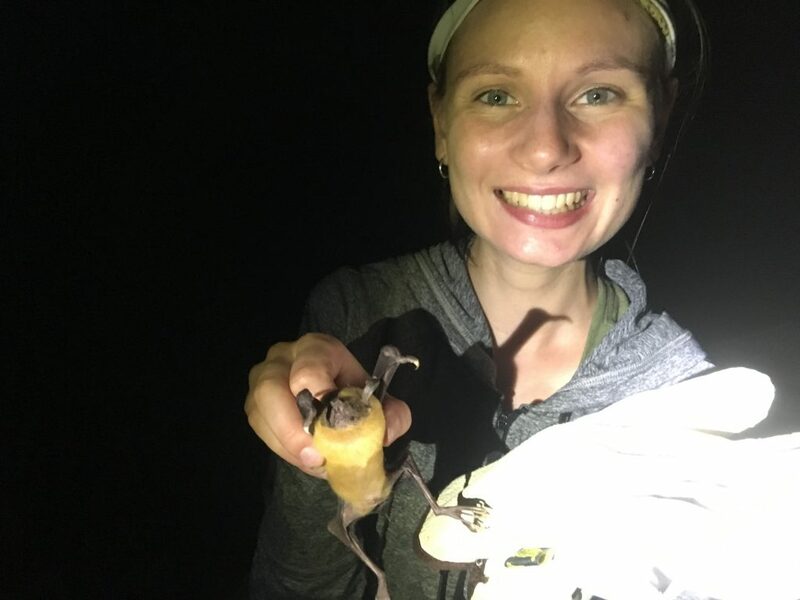 After four months of sampling, we have recorded 24 different species of bats, ranging from those that eat insects, fruits, nectar, fish, and yes, even blood. 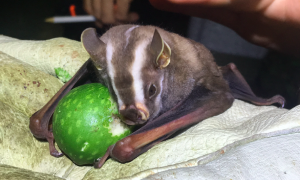 To add to this excitement, two species of fruit eating bats recorded in the restoration areas had not been previously detected on the Osa Conservation property! Why, then, has the bat nightlife been much more exciting than anticipated? Although the restoration areas have very few trees, the surrounding areas are lush with tropical forest, providing ideal habitat for these endearing creatures. This is very encouraging news for restoration initiatives, as connecting the surrounding forests with restored habitats will continue to support the diverse lifestyles of our nocturnal friends, so they may continue hunting insects, fishing bats, and snacking on figs. 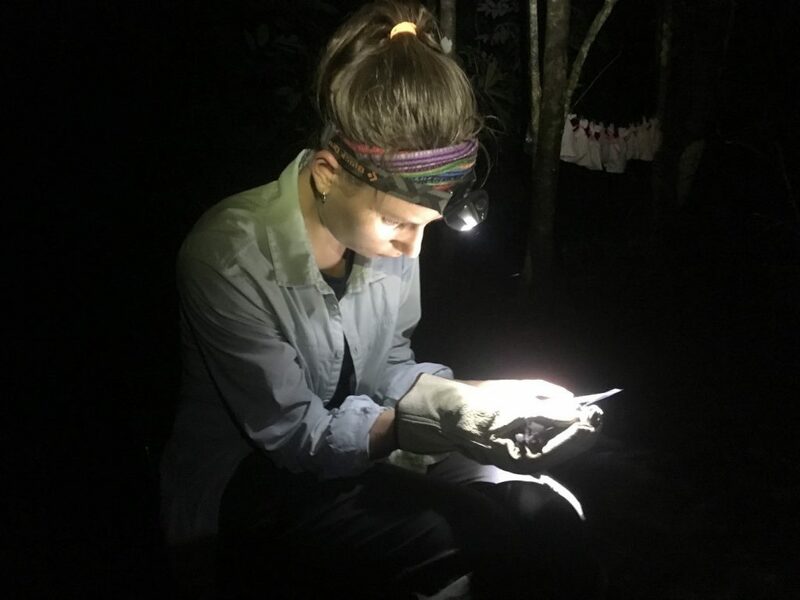 Now every night of sampling is an adventure, and I cannot wait to see what other bats we will encounter in these deceptively rich areas! I love vanilla! But did you ever wonder where it comes from? From the vanilla bean. But not from a tree; it comes from an orchid, which grows up the tree as a vine. However, it is not that simple. Each flower opens for only 24 hours and must be pollinated within 8-12 hours. If pollination does not occur the flower wilts, drops from the vine, and no pods are produced. The vanilla bean’s pollen is covered by a little septum (called the rostellum) that separates the anthers (male features), and stigma (female features). This means the some creature to go in and break this septum; a pollinator. It also means that vanilla conservation is a tedious and difficult task. 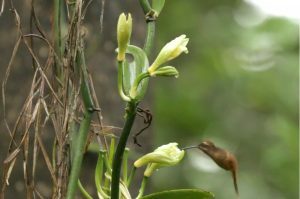 Costa Rica has approximately 12 species of vanilla, at least four of which are found around the Osa Conservation’s biological station and adjacent landscapes. 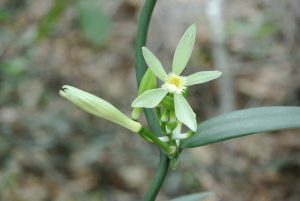 Only two species are grown to produce commercial vanilla: V. planifolia and V. madagascariensis. Because the natural pollinators are unknown, pollination is performed by hand, and low levels of genetic diversity are expected in cultivated plants. Many Vanilla species are threatened in the wild. Here at Osa Conservation, we want to understand the ecology of wild vanilla, and gain a better understanding of their habitat preference, and reproductive strategies. We want to know where they like to live, who their pollinators are, and who disperses their seeds. 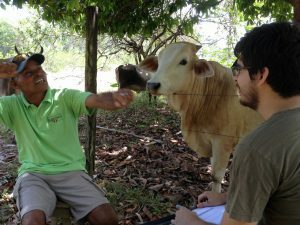 This could help us to develop proper conservation strategies, and allow us to test profitability for commercial production in areas such as secondary forests, restoration plots and fruit gardens. To do so, we have been using wildlife camera traps to monitor the flowers and beans, and have spent hours directly watching the flowers. So far, a population of Vanilla hartii was found flowering, and after a few long hours of observation and camera trapping, the little Stripe-throated hermit hummingbird was observed visiting their flowers; a potential pollinator or a nectar thief? 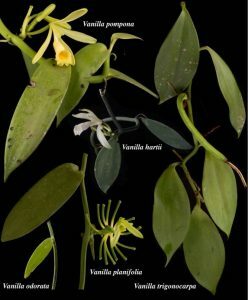 Our work will continue until we can really discover the secrets behind wild vanilla in the Osa Peninsula. We find ourselves in the middle of a project titled “Conservation and Management of Marine and Forest Resources in the National Terraba Sierpe Wetlands.” Our associates are APREMMA: a local community of fishermen and piangüeros working out of the Ajuntaderas area, a small community off the Southern Pacific coast of Costa Rica. 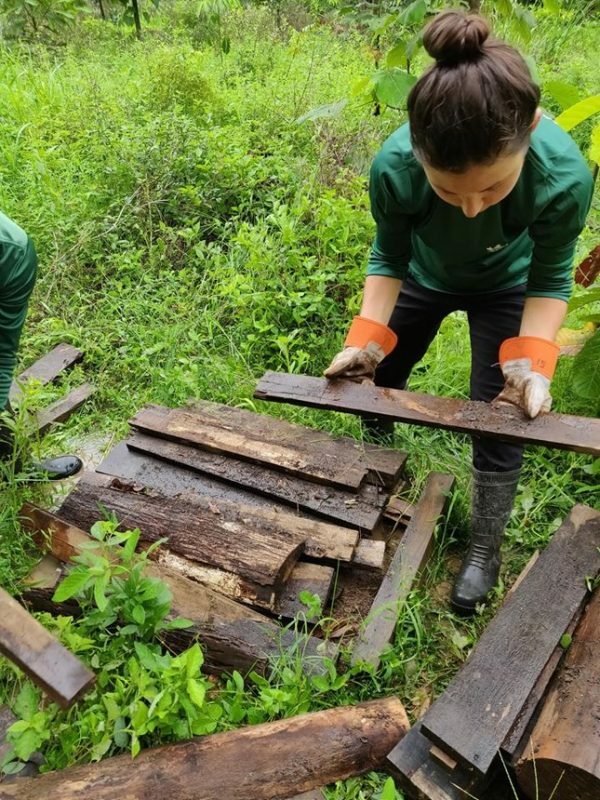 This newly formed group is looking for a method to develop a healthy relationship between their community and efforts to conserve the local wetlands. 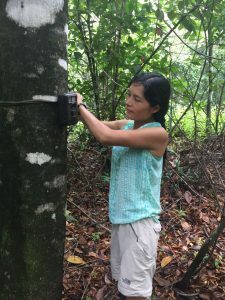 APREMAA, like many of the local communities throughout the country of Costa Rica, still maintain a great level of distrust for external organizations, interpreting their work as being “urban,” and having “first world” aspirations in their investigations, projects, studies, and diagnostics. Is there a stranger in the photo? OC staff during an interview with locals throughout an APREMAA diagnostic. This example, though ironic, reflects the work that a lot of NGO’s have done in the past with foreign communities, and for that matter, work they will continue to do as well. This metaphorical scenario reflects how we as NGO’s are viewed by these local populations, who have come to harbor so much distrust and resentment to outside coalitions. And to be fair, this resentment may be very well justified. NGO’s have become accustomed to disrespecting communities by extracting the woes of locals and thusly empowering themselves off this information as if it were gold. NGO’s operate only as “distant observers,” as alien who would rather impose external knowledge. The truth is that NPO’s are undoubtedly guilty of these actions – sometimes without the intent, and other times on purpose, but this is the reality of their situation. 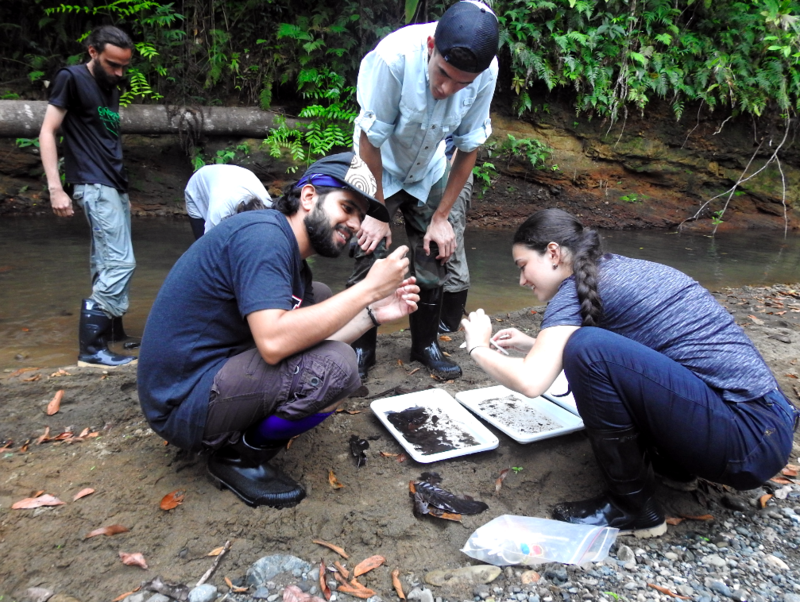 It is with this in mind that we who are working on this “Conservation and Management of Marine and Forest Resources in the National Terraba Sierpe Wetlands” project are attempting to incorporate ourselves into another type of work asides from the general extraction of knowledge. We aspire to work backwards from the usual scenario, and to work from the bottom-up. On one side we want to desperately understand the needs of the community that we are working within, all the while at the same time helping realize the aspirations of these existing needs. We believe that the needs of a community cannot just be recorded, they must also be solved in order for this exchange to be truly beneficial. For our part, a fundamental part of our work has been the transparency and sincerity of our organization. Our goal is not just to study the community, but also to work with the community as collaboration. We have also been dedicated to bringing with us to every session the issues generated in prior visits. 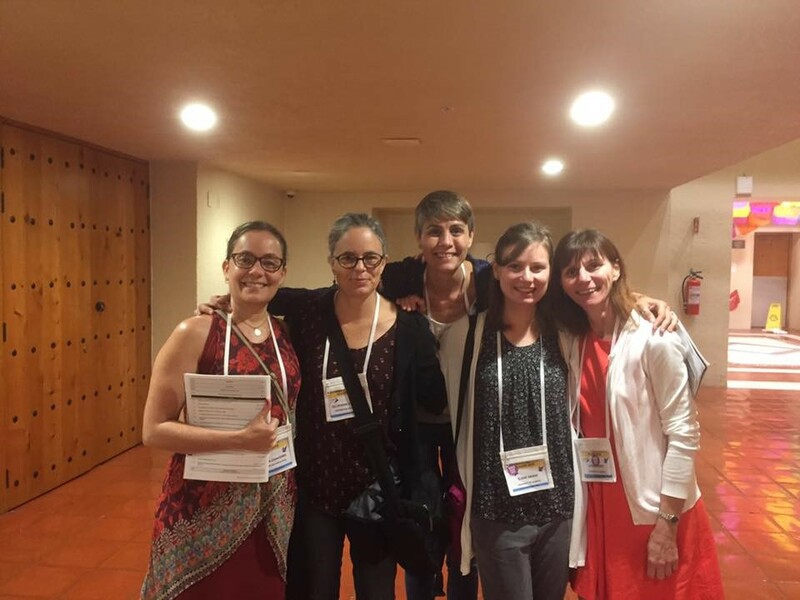 By bringing the information we’ve obtained from prior sessions (some with solutions, and some without,)we promote the idea that this kind of work requires constant collaboration between ourselves and the community. Out relationship with the members of APREMAA may be new, but we are already looking to turn the general distrust and resistance of outsiders into a situation of cordiality, open dialogue, trust , and cooperation in order to continue building real knowledge. We arrived from the outside, from far away, like aliens – but we are trying to incorporate ourselves to this local lifestyle and culture with the hope of becoming more human in the process.